An abused child, yet confident of her destiny to reign, a woman in a man's world, passionately sexual -- though, as she maintained, a virgin -- Elizabeth I is famed as England's most successful ruler. 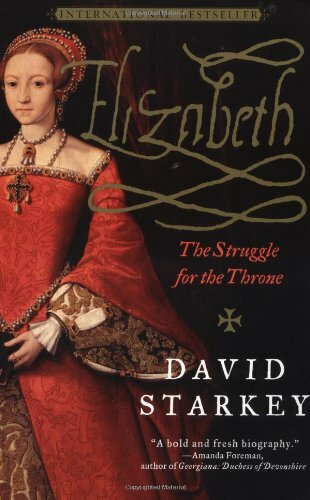 David Starkey's brilliant new biography concentrates on Elizabeth's formative years -- from her birth in 1533 to her accession in 1558 -- and shows how the experiences of danger and adventure formed her remarkable character and shaped her opinions and beliefs. From princess and heir-apparent to bastardized and disinherited royal, accused traitor to head of the princely household, Elizabeth experienced every vicissitude of fortune and extreme of condition -- and rose above it all to reign during a watershed moment in history. A uniquely absorbing tale of one young woman's turbulent, courageous, and seemingly impossible journey toward the throne, Elizabeth is the exhilarating story of the making of a queen.